Kimi Raikkonen has won his first race of the season after a thrilling Belgian Grand Prix as Michael Schumacher clinched the world championship. 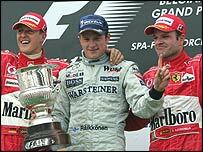 Schumacher's Ferrari finished second behind the McLaren after an eventful race punctuated by dramatic crashes. Raikkonen led by 12 seconds until a second of three safety car periods with 14 laps to go, but comfortably held off Schumacher in the final laps. Jenson Button's 200mph tyre failure prompted the second caution period. Rubens Barrichello finished third, despite being last at the end of the first lap, and was followed home by the Saubers of Felipe Massa and Giancarlo Fisichella and the Jaguar of Christian Klien. Button was lucky to escape uninjured after he suffered a puncture at the fastest part of the track. His BAR spun and collected the Minardi of Zsolt Baumgartner, but both men were unhurt after a crash that Button said "could have been horrific". David Coulthard also suffered late-race drama when he collided at more than 180mph as he tried to pass the Jaguar of Christian Klien with five laps to go. But the safety car period that resulted from the Scot's collision enabled him to come into the pits for repairs and rejoin and lose only two places, which he immediately won back to finish seventh. Williams lost third place twice within six laps. 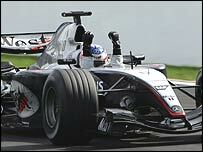 First Antonio Pizzonia dropped out with a gearbox failure on lap 31 and then Juan Pablo Montoya dropped out on lap 37. Montoya was another to suffer a puncture, and there will inevitably be criticisms of the decision not to stop the race for one or both of the two big crashes. The first happened on the first lap, when after a brief fracas among the front runners at the first corner, Takuma Sato's BAR collided with Mark Webber's Jaguar at the daunting Eau Rouge corner, prompting a pile-up. The safety car was deployed while the track was cleared, but Schumacher had already dropped down to fourth place behind the Renaults of Jarno Trulli and Fernando Alonso and Coulthard. The world champion lost another two places to Raikkonen and Montoya on the first lap after the restart, before settling down to consolidate his race. 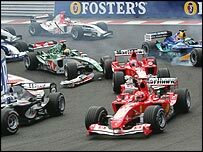 By the time the field had settled down after the first stops, the race had distilled into a straight fight between Raikkonen and Schumacher. And the Finn, underlining McLaren's return to form, always looked as if he had enough in hand to win, notwithstanding the nerves brought about by the two later caution periods, which removed his advantage. Schumacher said: "Kimi drove a superb race. It's a great day for all of us, I'm just so delighted." Raikkonen added: "We've had a difficult season. Finally we got what we deserved. I hope we can keep it up for the rest of the season and then challenge next year." Barrichello benefited most from the safety cars. He had been last at the end of the first lap after his car was damaged in a collision with Webber at the first corner. But the Brazilian was able rejoin without losing a lap, and set about regaining places. He was up to fifth place before the late drama with the safety cars enabled him to climb on to the rostrum. Renault's race fell apart when Alonso suffered an oil leak, causing him to spin out of the lead. Trulli had dropped a few places before he was hit by Montoya as they battled on lap 20. Pizzonia was another unlucky man - he was up to third when his gearbox failed during the penultimate safety car period.